Mural in Los Angeles's Koreatown reignites debate. March. 21, 2019 07:46. chan2@donga.com. A Korean artist organization has been sending complaints to a school district in Los Angeles for a mural on a public school gym in Koreatown in Los Angeles. Controversies have risen in some three months again as the school reversed its decision to get rid of the rising sun-like mural last December. 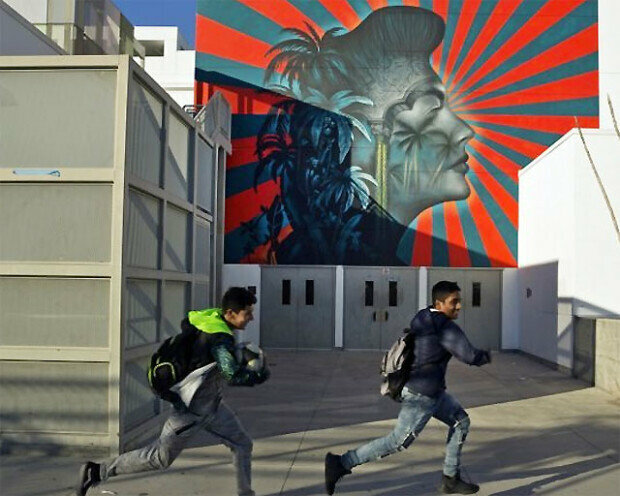 According to the Los Angeles Times on Monday (local time), an artist organization “Gyopo” recently delivered a letter to the LA Unified school district to remove or revise most of the rising sun pattern that is painted on the external wall of the Robert F. Kennedy Public School’s gym. The picture was painted by an artist named Beau Stanton in 2016. He expressed Ava Gardner, a famous movie star in the 1940s and 1950s, and the rays radiating out from Garner’s face are in the pattern of a rising sun of the imperial Japanese battle flag. Stanton stated that his mural had nothing to do with Japanese rising sun flag and the shape of sun rays appeared in his work in other states in the U.S. including Miami and New Jersey as well as some countries in Europe but did not cause any problem. Jennifer Mun, an artist under “Gyopo,” argued that even if the artist did not intend to do so, the image, which appears to symbolize the rising sun flag, may hurt Koreans’ feelings, instigating trauma. She also added that it feels like white men are killing the voice of Asians with their authority. In early December last year, the school and the school district announced that they agreed with the Korean community to remove the mural during winter vacation. Nevertheless, as Stanton and other artists who participated in producing the mural strongly opposed such decision, the school reversed its decision in just 10 days. As such, the Korean organization opened a website for appeal once again, urging the school to remove the mural. The school and the school district said that they take people’s opinion on the mural seriously, and that they will make a decision after discussing the matter with inside members.